Heathrow map. Heathrow airport map (England) to print. 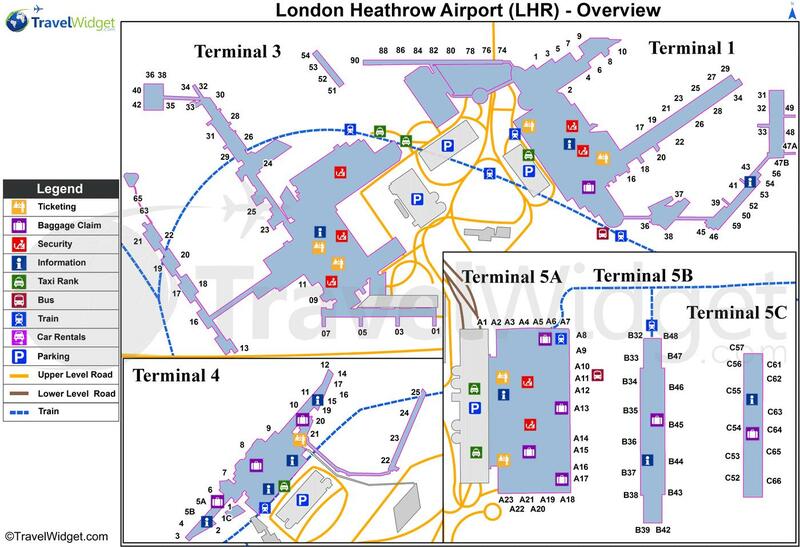 Heathrow airport map (England) to download. Whether by number of flights or frequency, Heathrow Airport is the hub of choice for international travel and London. Because of the size of Heathrow Airport and its traffic, it is essential to check which terminal you need to go to for your departures or arrivals. The map of Heathrow Airport will help you. Underground: Heathrow Airport <> London - Heathrow Airport is connected to the Piccadilly line which allows you to reach London at a lower cost. Refer to the map of Heathrow Airport. Train: Heathrow Airport <> London - The train is the fastest way to get to the city center from Heathrow Airport: take 15 minutes to reach Paddington Station. The map of Heathrow Airport will show you where to take the train. As shown by the Heathrow Airport map, located 32 km west of central London, London Heathrow Airport (LHR) is one of the busiest and most modern airports in the world. . With 190,000 passengers disembarking and boarding each day, Heathrow Airport welcomes more international passengers than any other airport in the world. With the Heathrow Airport card, transfer between terminals will be easy. Heathrow Terminals 1, 2 and 3 are not far apart; they are accessible by underground passages. The transfer between Terminals 1, 2 and 3 and Terminals 4 and 5 is free and provided by the Heathrow Express train. It is easy to locate thanks to the map of London Heathrow Airport.